Genesis 45:10 You shall dwell in the land of Goshen, and you will be near to me, you, your children, your children's children, your flocks, your herds, and all that you have. Genesis 46:28 He sent Judah before him to Joseph, to show the way before him to Goshen, and they came into the land of Goshen. Genesis 46:29 Joseph made ready his chariot, and went up to meet Israel, his father, in Goshen. He presented himself to him, and fell on his neck, and wept on his neck a good while. Genesis 47:6 The land of Egypt is before you. Make your father and your brothers dwell in the best of the land. Let them dwell in the land of Goshen. If you know any able men among them, then put them in charge of my livestock." Genesis 47:27 Israel lived in the land of Egypt, in the land of Goshen; and they got themselves possessions therein, and were fruitful, and multiplied exceedingly. Genesis 50:5 'My father made me swear, saying, "Behold, I am dying. Bury me in my grave which I have dug for myself in the land of Canaan." Now therefore, please let me go up and bury my father, and I will come again.'" Genesis 50:8 all the house of Joseph, his brothers, and his father's house. Only their little ones, their flocks, and their herds, they left in the land of Goshen. Exodus 8:22 I will set apart in that day the land of Goshen, in which my people dwell, that no swarms of flies shall be there; to the end you may know that I am Yahweh in the midst of the earth. Exodus 9:26 Only in the land of Goshen, where the children of Israel were, there was no hail. The region where the Hebrews dwelt in Egypt. If the Septuagint reading Gesem be correct, the word, which in its Hebrew form has no known meaning, may mean "cultivated"-comparing the Arabic root jashima, "to labor." Egyptologists have suggested a connection with the Egyptian word qas, meaning "inundated land" because Goshen was apparently the same region, called by the Greeks the "Arabian nome," which had its capital at Phakousa representing the Egyptian Pa-qas (Brugsch, Geog., I, 298), the name of a town, with the determinative for "pouring forth." Van der Hardt, indeed, more than a century ago (see Sayce, Higher Criticism, 235), supposed the two words to be connected. Dr. Naville in 1887 found the word as denoting the vicinity of Pi-sopt (now Saft el Henneh), 6 miles East of Zagazig-in the form Q-s-m. He concludes that this was the site of Phakousa, but the latter is usually placed at Tell el Faqus, about 15 miles South of ZOAN (which see), and this appears to be the situation of the "City of Arabia" which Silvia, about 385 A.D., identifies with Gesse or Goshen; for she reached it in her journey from Heroopolis, through Goshen to Tathnis or Taphnis (Daphnai), and to Pelusium. 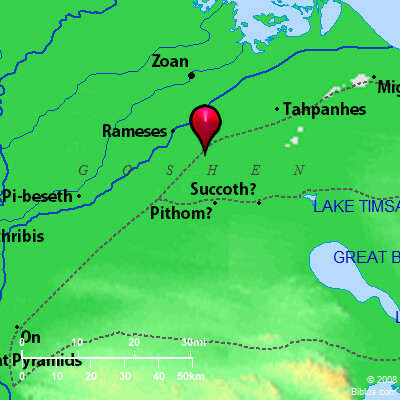 It is generally agreed that Goshen was the region East of the Bubastic branch of the Nile; and in Psalm 78:12, 43, it seems to be clearly identified with the "field (or pastoral plain) of Zoan," which was probably also the "land of Rameses" mentioned (Genesis 47:11) as possessed by Jacob's family (see RAAMSES; ZOAN). Where first mentioned (Genesis 45:10), Goshen is promised by Joseph to Jacob as a land fit for flocks, and the Septuagint here reads, "Gesem of Arabia," probably referring to the Arabian nome which took its name from the "desert" which defended the East border of Egypt. In the second notice (Genesis 46:28 f), the boundary of the land of Goshen, where Joseph met his father, is called in the Septuagint Heroo(n)-polis, and also (Genesis 46:28) "the land of Ramesse(s)"; so that in the 3rd century B.C. Goshen seems to have been identified with the whole region of the Arabian nome, as far South as Heroopolis which (see PITHOM) lay in Wady Tumeilat. Goshen included pastoral lands (Genesis 46:34; Genesis 47:1, 4, 6, 27; 50:8) and was still inhabited by the Hebrews at the time of the Exodus (Exodus 8:22; Exodus 9:26), after which it is unnoticed in the Old Testament. The name, however, applied to other places which were probably "cultivated" lands, including a region in the South of Palestine (Joshua 10:41; Joshua 11:16), "all the country of Goshen Septuagint Gosom), even unto Gibeon," and a city of Judah (Joshua 15:51) in the mountains near Beersheba. These notices seem to show that the word is not of Egyptian origin. The region thus very clearly indicated was not of any great extent, having an area of only about 900 square miles, including two very different districts. The western half, immediately East of the Bubastic branch of the Nile, stretches from Zoan to Bubastis (at both of which cities records of the Hyksos ruler Apepi have been found), or a distance of about 35 miles North and South. This region is an irrigated plain which is still considered to include some of the best land in Egypt. The description of the land of Rameses (see RAAMSES), in the 14th century B.C., shows its fertility; and Silvia says that the land of Goshen was 16 miles from Heroopolis, and that she traveled for two days in it "through vineyards, and balsam plantations, and orchards, and tilled fields, and gardens." The region narrows from about 15 miles near the seashore to about 10 miles between Zagazig and Tell el Kebir on the Southeast of this, a sandy and gravelly desert lies between the Nile plain and the Suez Canal, broadening southward from near Daphnai (Tell Defeneh) to Wady Tumeilat, where it is 40 miles across East and West. South of this valley an equally waterless desert stretches to Suez, and from the Bitter Lakes on the East to the vicinity of Heliopolis (Southeast of Cairo) on the West. Thus, Wady Tumeilat, which is fertilized by the Nile waters (see PI-HAHIROTH), and contains villages and corn fields, is the only natural route for a people driving with their flocks and herds by which the vicinity of the Red Sea can be reached, the road leading from the South end of the "field of Zoan" near Bubastis, and 40 miles eastward to the "edge of the wilderness" (see ETHAM) and the head of the Bitter Lakes. This physical conformation is important in relation to the route of the Israelites (see EXODUS); and Wady Tumeilat may very possibly be intended to be included in Goshen, as the Septuagint translators supposed. (1) Mentioned as a country ('erets) in the South of Judah distinct from the "hill country," the Negeb and the Shephelah (Joshua 10:41; Joshua 11:16). Unidentified. (2) A town in the Southwest part of the hill country of Judah (Joshua 15:51), very probably connected in some way with the district (1). GO'SHEN, the exact limits, of this district in Egypt, are not known, but it was some where in those parts on the e. of the Delta where the name appears on the map. GO'SHEN, supposed to be now Sekiyeh, 40 ms. s. of Jerusalem.